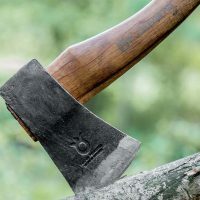 The first thing we need to do is to distinguish the difference between an axe, a hatchet and a tomahawk and why you would use one over the other whether it be for camping, backpacking or survival. 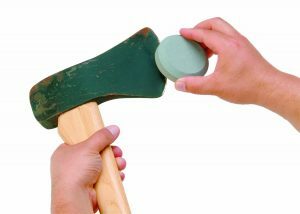 The main difference between a hatchet and an axe is that a hatchet is a much shorter version of an axe. A hatchet is usually about 12 inches long. An axe is over 22 inches long. Because axe’s have longer handles, they have more chopping power so make processing wood faster and easier. However, because they’re bigger, they take up more room and weigh more. 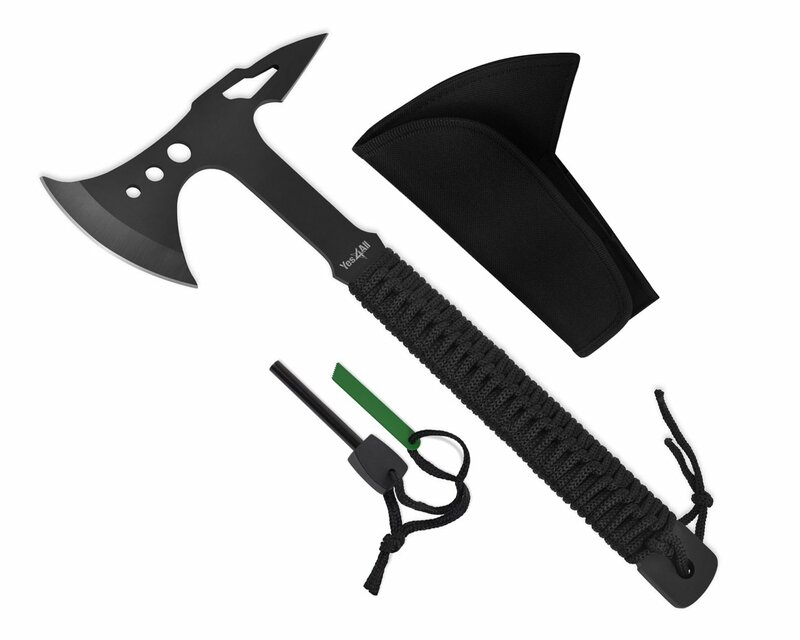 So if you’re carrying your axe in your bug out bag or backpack if you’re backpacking and are lugging it around, you’re probably best off with a hatchet. If you’re camping and you have a car and space isn’t at a premium, it’ll come down to personal preference and how much wood you’ll process as to whether you want a camp hatchet or a camp axe. If the cutting tool is for use around the home and you need to process bigger pieces of wood, you’re best off with an axe. 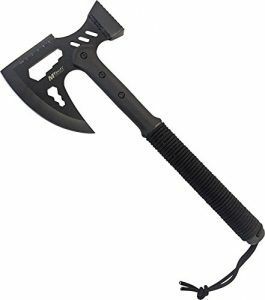 If you need a tool that is needed mainly for self defense but also a little wood processing, you’re best off with a tactical tomahawk. The reasons are that they can be thrown easier because they’re light weight and in close combat, tomahawks are lighter so can be wielded with greater speed and accuracy. Check out my page on the different types of axes. If you live in an urban area, you might be best off with a tactical hatchet. The Rolls Royce of hatchets. You can hand this tool down to your grandchildren. This is the best value hatchet you can buy. For those that like their tools to have multiple functions. This is more of a "fun" tool to have a good time with. If you’ve got a tree you need to deal with, only the best survival axe is going to give you the firewood, shelter or protection you need. It doesn’t matter if you need a hatchet for survival, backpacking or camping, they have the same features and serve the same purpose. If you’re backpacking or camping and can’t process wood with your hatchet, well you might actually find yourself in a survival situation. In my opinion, the humble hatchet is more important than a knife because you can do more with a hatchet and you can process wood far easier with a hatchet. What I generally do when camping is to take a camping hatchet or a survival machete along with a small, lightweight and really sharp knife or one of my survival knives. That way I can process wood really easily with my camp hatchet, but can then do the finer tasks like gutting a fish with small knife. It’s the best of both worlds. As a backup to your hatchet, you could try one of these survival tools. Knowing about the parts of a survival axe and what makes for good or bad quality with these parts will help you in your selection of your axe. Handle – This part of the survival axe used to be made from a straight-grained piece of wood, usually hickory. Today, many axes have handles that consist of fiberglass or metal. 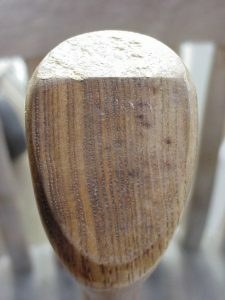 An axe handle is designed to direct the force on the axe head. Obviously an axe handle takes a beating so you need a great handle/haft. 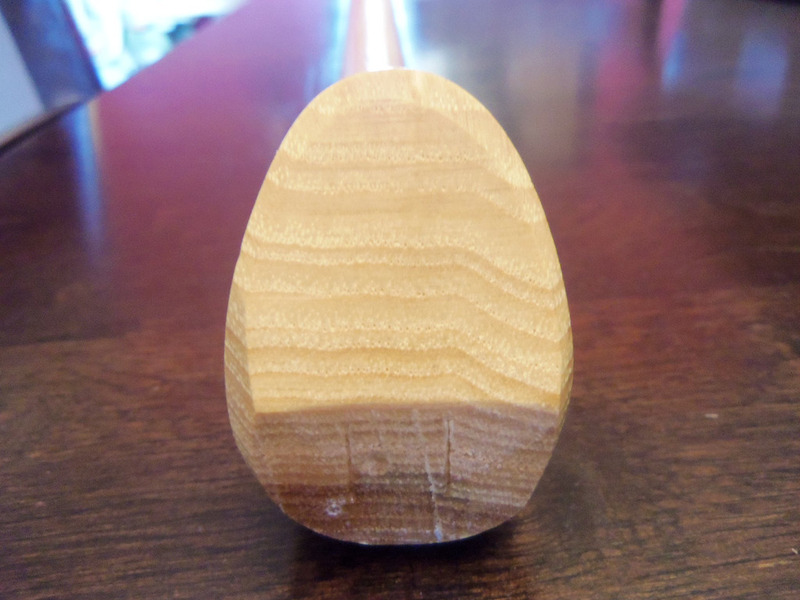 When choosing a wooden handle take note of the grain. The grain of the wood should be the same as the top image, directed toward the blade because that is the strongest orientation of the grain to withstand severe force. In the bottom image, the grain is horizontal and this type of handle is much more likely to break which can lead to serious injury for the person using the axe. Cheaper axe’s don’t have as quality hafts because well, quite simply, they’re cheaper and not everyone knows to keep a look out for grain direction. Head – This part of the survival axe is obviously what bites into the wood or a zombie if needed. The best quality-made axes are ones that have been designed out of forged steel with a high carbon cutting edge. Just to clarify, the entire axe blade doesn’t have to be high carbon steel, in fact the axe head is better off being low carbon steel because it will give the axe blade more flex. That’s actually the way that vikings used to make their axes, low carbon steel head with a high carbon steel cutting edge. The piece of high carbon would be inserted into the low carbon steel and forge welded together. Stainless steel is definitely an inferior product. There are some axes – like the ones the Estwing axe company design – made out of a single piece of metal, and has comfortable rubber grip that attaches to the metal handle. When using an axe, make sure you take care. It is so easy to seriously injure yourself. Also make sure you keep your axe sharp. If you’re out in the field you can easily carry a Lansky dual grit sharpener. 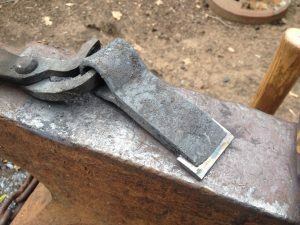 Check out my page on how to sharpen an axe. I am so sick and tired of watching survival shows with “survival experts” cutting wood incorrectly. These guys might have great knowledge in the survival game but they don’t know how to cut wood. When you’re cutting wood like cutting down a branch or a tree cut at an angle, do not strike the wood with your axe blade straight on (perpendicular). Check out an expert chopping wood, you’ll see that he always cuts at an angle. Obviously he’s going through a massive piece of wood but the same rule applies for thinner pieces of wood. So this section will be broken down into two sections. The first will be on the more traditional type of hatchets and the second will be on multi-functional hatchets. What’s the difference between the two? Traditional hatchets (even if they use modern materials like FiberComp like the Fiskars X7 does), have pretty much the same functionality as they have since the start of time. They have a sharp cutting edge on one side, hammer on the other. If you’re interested in multi-functional survival hatchets, click here. 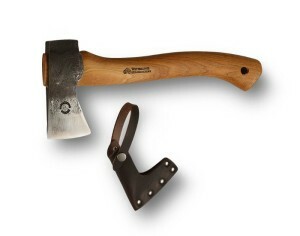 The Gransfors Bruks wildlife hatchet is the best camping hatchet. When you want a hatchet that you can pass on to future generations with a smile on your face, you should purchase this Swedish axe. This is the hatchet I choose to keep in my bug out bag. It’s ideal for people who want a more conventional-kind of hatchet. 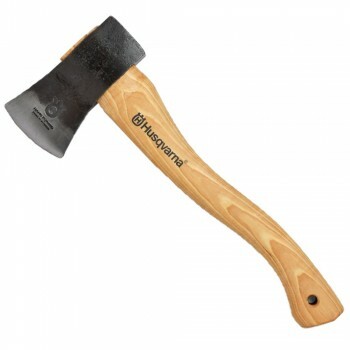 When it comes to all Gransfors hatchets, this is one of the more popular models. When you need a small survival axe that’s got power and need something to carry in your rucksack, you don’t need to look any further than the Gransfors Bruks Wildlife Hatchet. This hatchet is razor sharp… right out of the factory. Since it is well-balanced and feels good in the hand, it can outdo many axes on the market. The balance the axe offers makes it great for throwing. The axe can easily cut small logs for a fire or cut down large tree branches. Great shape and size with an edge that holds perfectly. It’s ideal for camping, small enough for carving and is so sturdy that it can be used for most things. The sheath’s shape, which conceals the top part of the poll and edge, can ensure the survival axe head doesn’t cut your backpack. This hatchet is great for kindling purposes and is even useful as a spatula. The Gransfors Bruks Wildlife Hatchet is hand-crafted product that’s designed in such a way that it can be extremely useful for any occasion for years to come. It’s the Rolls Royce of hatchets and is certainly not a cheap option but if you can afford it, this is the one to go for. Check out the latest price at Amazon. 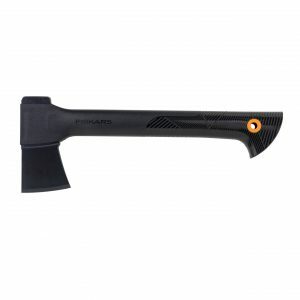 People looking for a modern hatchet that can be used for backpacking, camping and hunting don’t need to look any further than the Fiskars Hatchet – X7. 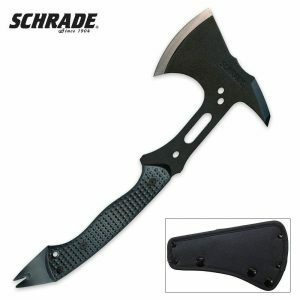 I use this hatchet a lot when I go backpacking or camping, to me it’s the best backpacking hatchet available. There’s a reason why they call it the “backpackers chainsaw”. It’s because this hatchet cuts unbelievably well. One of the reasons I don’t always take my Gransfors with me into the woods is I don’t like taking equipment out of my bug out bag and the Fiskars X7 is highly visible which is great when the weather is going to be fairly miserable. 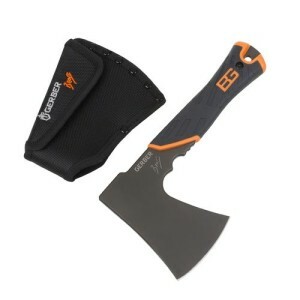 Having said that the hatchet comes in 2 colors, orange and black. Those of us who do a lot of backpacking or camping know that visibility isn’t always great and you can be tired. The last thing you want to do is to have to look for your hatchet. The bright orange of this hatchet stands out and is really easy to see when you’re in the woods. If you’re in a survival situation you need an hatchet that can take punishment, period. The last thing you need is faulty, flimsy equipment. 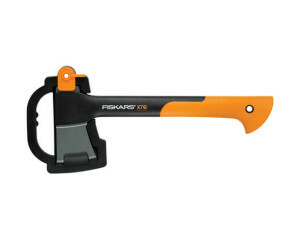 So how tough is the Fiskars X7 hatchet? The price! Even though the hatchet is made in Finland (an expensive country to do anything!) the cost of the hatchet is really reasonable. Click here to check out the latest price of the orange option and here for the black option. 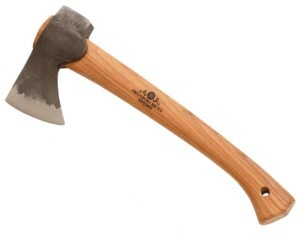 The Fiskars Hatchet, won the 2010 “Best of the Best” product design award in the garden category. It’s perfect for cutting small to medium-sized logs along with kindling. It brings together even weight distribution, superior blade geometry, sharpness and nearly unbreakable design to boost your performance. Due to the combination of these features, the blade can cut three times deeper as it chops. And, with additional blade penetration on every swing, more wood can be chopped in less time, less effort and little hand strain. The FiberComp handle is stronger than steel, which means it’s nearly indestructible. Its low-friction blade can power through wood and keeps the head from getting stuck. The hardened forged steel blade ensures longer sharpness than seen with conventional axes. The blade is factory sharp and won’t dull very easily. Even when it gets nicked, the X7 will cut better than many other on-the-market axes. The hatchet’s got a non-slip, comfortable grip to decrease the hand strain and provide better control. What makes the X7 so great? 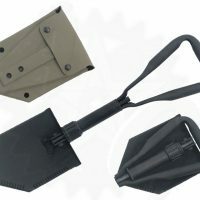 When you need to clear the brush of your favorite area or need kindling for a fire while camping, this reasonably priced tool will ensure you get the tool you need. And yes, this hatchet is one of the best on the markets, even while backpacking or camping. 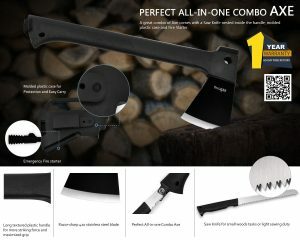 All of the above are the reasons why I believe that the Fiskars X7 is the best value camp hatchet. There’s just one negative point to this hatchet, which is that it’s got a Sandi-style edge that can easily chip and quickly dull, especially when compared to other axes. Some might not like the modern look of the hatchet. 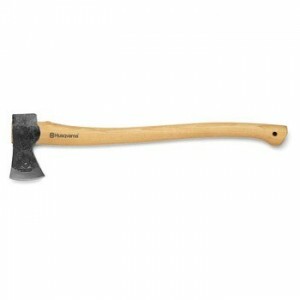 If you’re still looking for a great quality, well priced Scandinavian made hatchet I would recommend the Husqvarna hatchet. The head is securely affixed to the handle with both a steel and wooden wedge. A hand-forged head is created with a nice even grind. This is absolutely one of my favorites so I’ve done a full Husqvarna hatchet review. 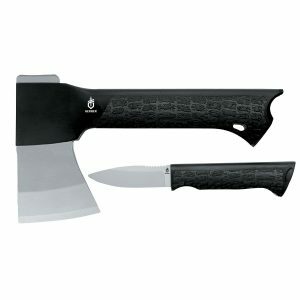 This hatchet model is perfect for people who want a more traditional feel and look but it is very expensive – price. It’s a great hand-crafted, well-balanced tool. It’s the kind of hatchet that can last generations. It’s factory sharp and maintains its edge. I’ve got an in depth review of the Wetterlings hatchet. If you love camping or spend any time outdoors, you may want to consider the purchase of an Estwing Hatchet – E24A. 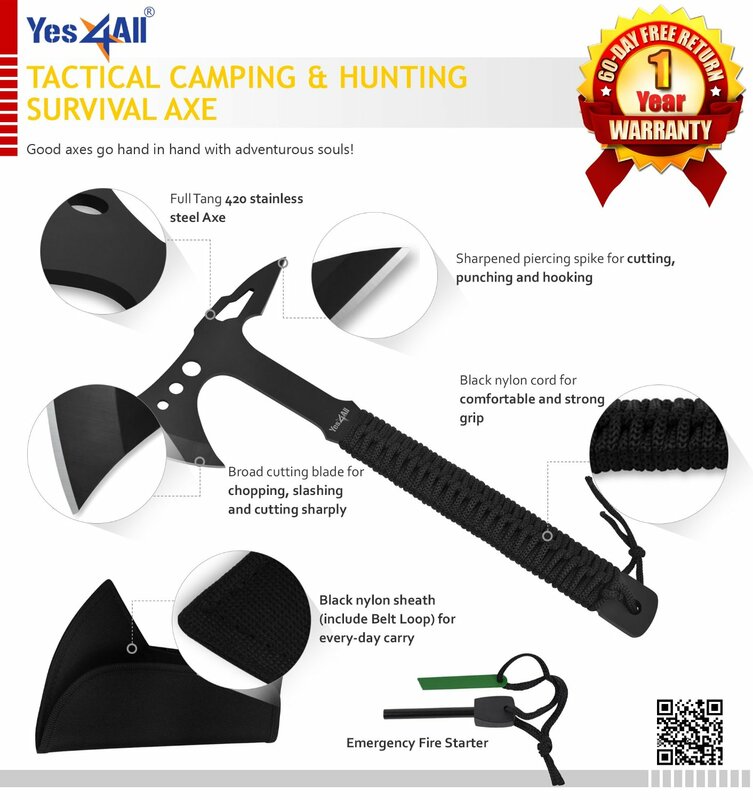 This type of survival axe strikes a good balance between weight and size and is cheap – latest price. Weapons collectors will even take to this Estwing-designed hatchet because it’s a real piece of art. This hatchet has just a single piece of metal so you don’t have to worry with the handle or head breaking off. You may be wondering who this hatchet was designed in mind for. Well, any person who wants to go camping, backpacking or hunting, or any individual who loves classic hatchets, should consider this one for their repertoire. It consists of just one piece (all steel) that includes a real leather grip. Both the handle and head have been forged together, creating the one-piece look. It’s completely polished with a real leather sheath and grip. It’s useful for rough usage – hammering and splitting wood. When it comes to being used and abuse, this hatchet can take it. If you’re looking for a hatchet that will last for years, you’ve got it with the Estwing Hatchet – E24A. You don’t need to worry with a loose head. The axe’s balance and weight are good, making sure that you can quickly get through your “task” without feeling worn out. For that reason, it’s perfect for any occasion and person. It’s comfortable in your hand – before, during and after use. It’s a useful tool for any job you need it for. It’s made of superior-quality steel, which can easily be sharped to keep its edge. Thus, you’ll never have to replace the blade. Great to use for a backpacking hatchet. Hatchet can be used inside and outside the home and kit. Beautiful wrapped handle that’s made of the best leather. The sheath is a perfect fit and has a great design. 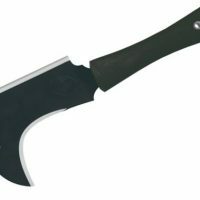 According to one 5-star review, a person who is complaining about the Estwing Hatchet E24A just likes to complain and isn’t happy about anything. When the handle gets wet, it can be hard to handle because of its slippery nature. If you’re going camping, it’s not going to be the lightest of all available hatchets. However, the weight of this hatchet can assist you when you’re chopping at small tree trunks or branches. The sheath was created in China, Haiti or Taiwan. But, should there be any issues, the hatchet can be sent back for a replacement. 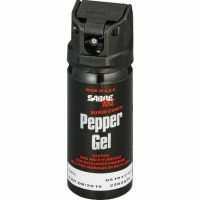 Another issue that has cropped up is that a citrus-based cleaner softened the leather handle sealant. If you’re looking for a special gift for the outdoorsman or woman in your life that’s also reasonably priced, then you need to pick this up. Click here for my full review of the Estwing Hatchet. 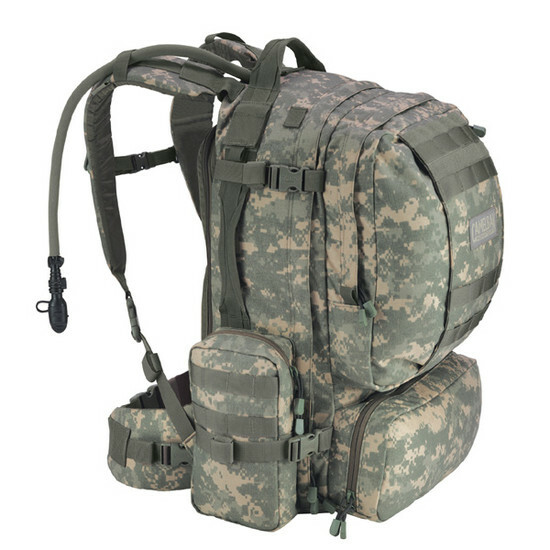 Need a great tool for your bug out bag? 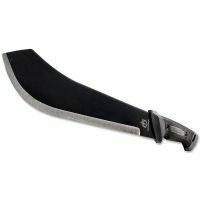 Consider the Bear Grylls Survival hatchet – a smaller than normal hatchet that’s a little bigger than a survival knife. This hatchet lets you easily do small task or use it as a hammer. 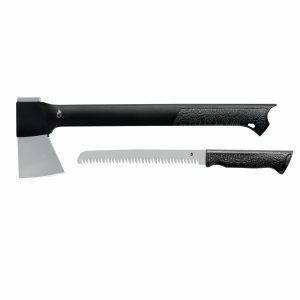 If there’s a small tree you need to cut down, then you don’t want this hatchet – you need a hatchet with a longer handle. It’s the kind of hatchet that’s great to have on hand… when you need it! 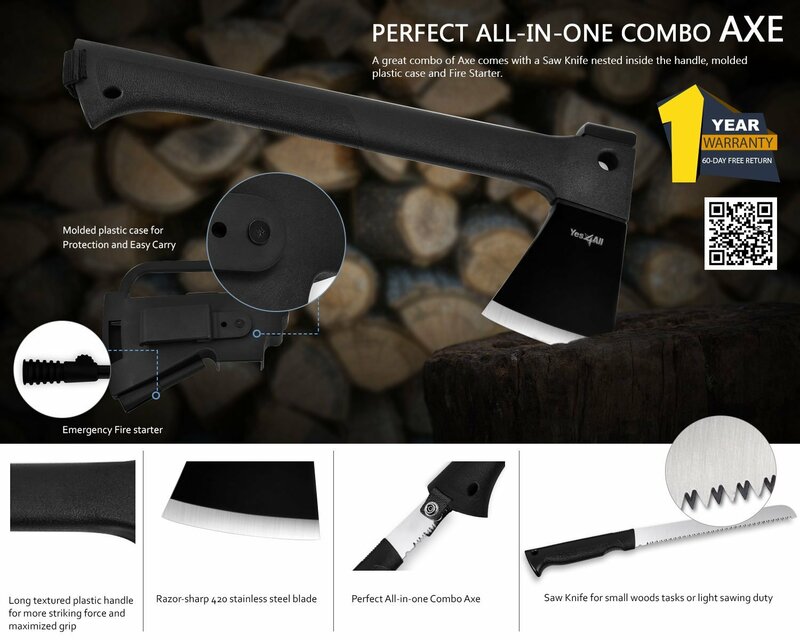 This hatchet is ideal for people who love the modern look and feel, and are going to use it for camping, backpacking, hammering, hunting and bushcrafting. The Bear Grylls Survival Hatchet is considered a compact survival hatchet with a forged head and handle that ensures neither break. A rubber handle makes sure it never slips, regardless of the conditions (rainy). It has finger notes just under the head, which allows you to securely hold the survival axe with perfect control while you strip bark. The hatchet is extremely light, making it a worthwhile carving tool. 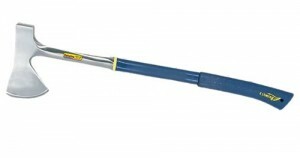 It’s useful for all sorts of camp duties – hammering stakes into the ground, beating and tenderizing meat and straightening up a bent up backpack. When you need a backpacking hatchet that can be a jack of all trades, then you need one of the market’s best hiking hatchets available… the Bear Gryll Survival hatchet. 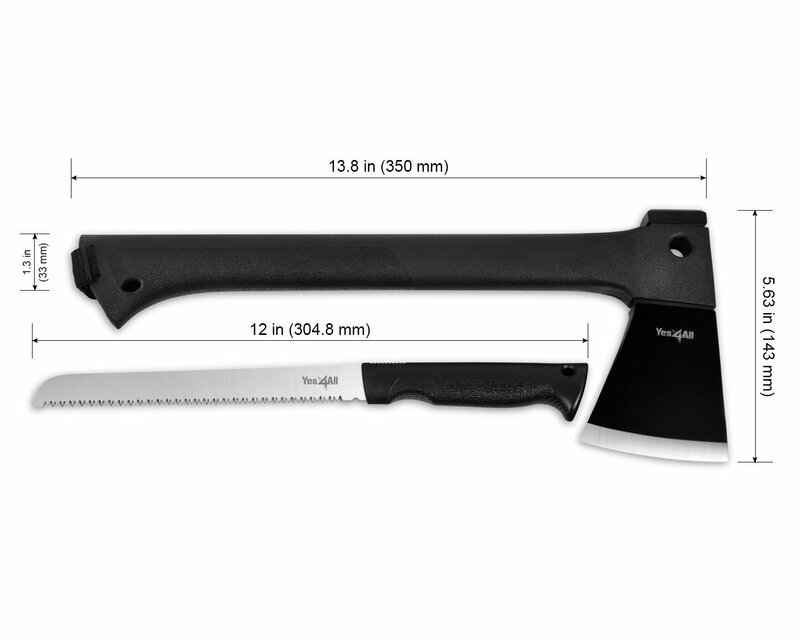 The hatchet is extremely small, measuring at just 9.45 inches. 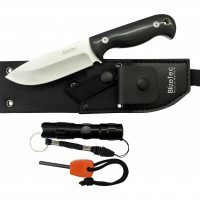 Therefore, if you need a big survival knife, you need to keep looking. On top of that, the nylon sheath could use some improvement, as it doesn’t have the best possible quality behind it. There are clearly many benefits of owning a survival hatchet. If you’re looking for the best of the best and money isn’t an option, go for the Gransfor Bruks. If you’re looking for a hatchet that works great, is durable and won’t break the bank try either the Fiskars X7 or the Husqvarna hatchet. Ok, ok, I admit it, I have a massive weakness for tools that just look awesome. Yes function must come first but if I can find a tool that looks incredible, functions well and I love using it, I’m happy. If you’re looking for multi functional tools, check out my survival tools page. I must admit, I just love the look of this hatchet. It’s not just good to look at though, it’s also a really great hatchet. It’s an inch or two bigger than most hatchets to help give it a bit of extra “oomph” and is reasonably priced. 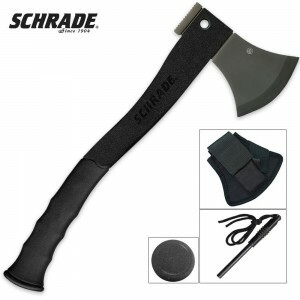 Check out my Schrade SCAXE2L Survival hatchet review. Many multi-functional “survival hatchets” don’t really process wood well but this one does. If you’re looking for an awesome looking tool that is completely functional at a good price, this is for you. More of an urban hatchet than an wilderness hatchet. It does process wood well but not as well as a hatchet specifically designed for chopping wood. If you’re processing some wood, but not a heap of wood, then it’s an excellent choice because it’s just so much fun to use. Considering the price you pay, it’s definitely worth it. Don’t be put off by the gimmick of a saw in an axe or that the hatchet has a hollow handle. 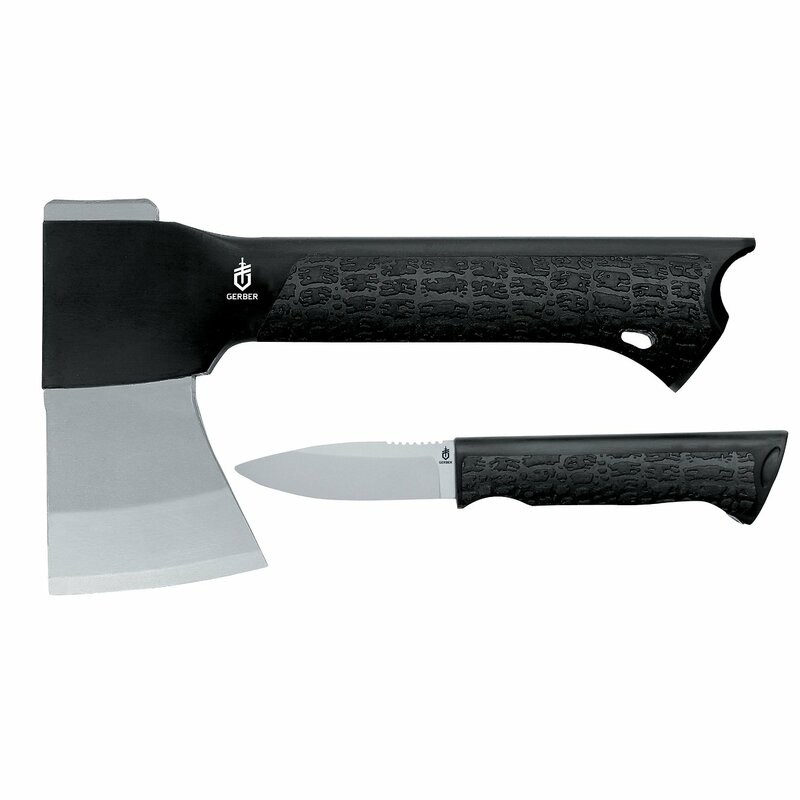 At 15.60″ it has a lot of power and many of the best hatchets (like the Fiskars X7) have a hollow handle. Sometimes, when your tired, or you just can’t get to branch very well a saw is a better option than a hatchet. It’s a 2-in-1 really good product. It’s a good tool, especially considering the price and I’m always happy to see a company back their product, it has a one year warranty, 60 day free return. It is what it is, a multi-funcitonal camping axe at a really good price. Suits those that aren’t going to be using it all the time. Looks great, too light to really process wood. It’s a fun, super cheap toy. You get what you pay for, you can’t expect great quality at the price point it’s at. I’ve never been a fan of paracord handles either. 17.5″ which is enormous for a hatchet. Includes a cord lanyard. Looks awesome, good price but it’s just not great at processing wood. It is one hell of a cool axe though. It doesn’t matter if you live life in the woods or not, it is important to own axes. Not because it is vital tool, but because you will be amazed at how many tasks get easier whenever you have an axe. Having a multipurpose axe is virtually indispensable and when you buy one that is made of high quality materials then you will be guaranteed that it will last for many years to come. They are made from durable materials and have different designs that will certainly make chopping and felling so much more ergonomic, efficient, and comfortable. Below I’ll go over the best axes for any purpose whether it be survival, camping or just around the home. This is perfect for just about anyone. It has a lot of power that is great for splitting logs. This axe is the perfect example of weight distribution, extra sharp edge, professional blade geometry, and a virtually unbreakable design that will give you the ultimate performance. The mix of these features will give you a blade that will destroy wood without any hard work at all and it does it with efficiency with the maximum amount with one swing. You will be able to split wood so much easier with this axe, that you will find it takes less time and needs less strain and effort. Check out my full review. This is a really great camping axe. 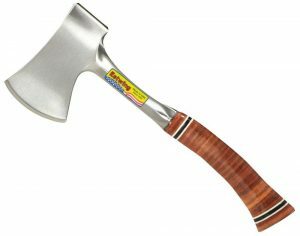 This has a great hickory handle and made with Swedish steel construction, you will find that this axe will give you the ultimate performance and durability. You will be able to enjoy a curved handle for great support while you are using it and the leather sheath that protects it will be your best friend. Everyone absolutely love this axe due to the fact that it certainly makes cutting wood so much easier than it was before and the elegant but simple design is very effective when being used. Husqvarna is a trusted name in tools and this axe is just another great example of why their name stands out. For more information see my Husqvarna axe review. This is a really popular camp axe. This axe is perfect for felling trees, trimming trees and even splitting wood. You will find that is also great notching timbers and driving stakes as well as so much more. It is made from one piece of solid steel and the design was made to keep it from having loose heads. The nylon vinyl grip are cushiony as well as bonded to the steel to give you the best durability and comfort which makes for less wrist and hand strain. The Estwing family take a lot of pride in this design. Check out my complete review of the Estwing E45A Campers Axe. 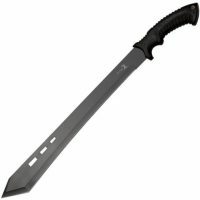 Cold Steel make everything from axe’s to swords to knives. They make good quality products at an affordable price and this axe is certainly at the lower end of the cost scale but is still a good product. Check out my review of the Cold Steel Trail Boss. 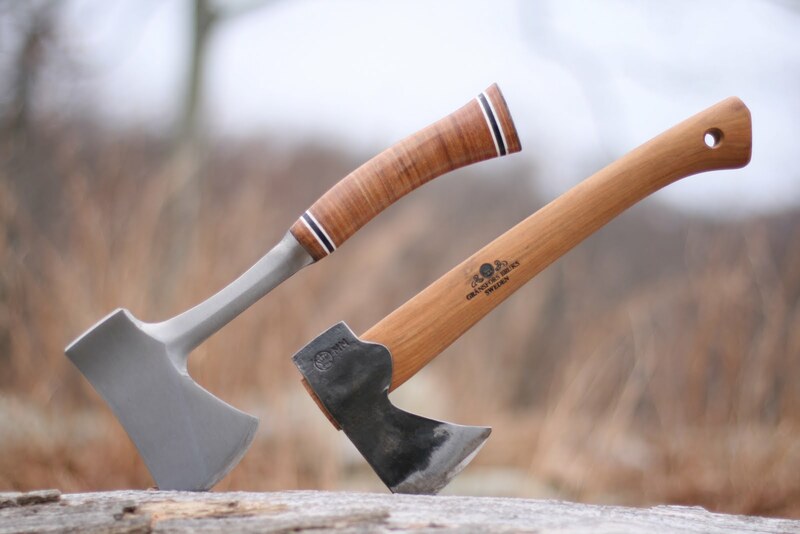 These top rated axes are on the top because they are made from high quality materials that are meant to stand time. They are perfect for multipurpose use and they are at reasonable prices too. You can be rest assured that whenever you purchase one of these axes, you will be getting a tool that will last you for many years, that make chopping so much easier than it was before. If you’re in a survival situation and need heat, you’ll need a fire and you’ll need a splitting axe. Check out my page on the best splitting axes. I’m a big fan of the Fiskars X27. 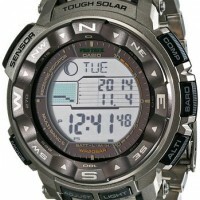 If you’re interested in survival gear, don’t overlook a good survival watch. You might also be interested in a brush axe.